This two-part guide will educate you about sustainable investing and introduce you to a robo-advisor who can seamlessly invest your money sustainably and in line with your values. If you’ve ever wanted to invest in companies that matter to you, but didn’t know where to start, this Complete Guide to Sustainable Investing for Robo-Advisor Investors will put you on the right path. 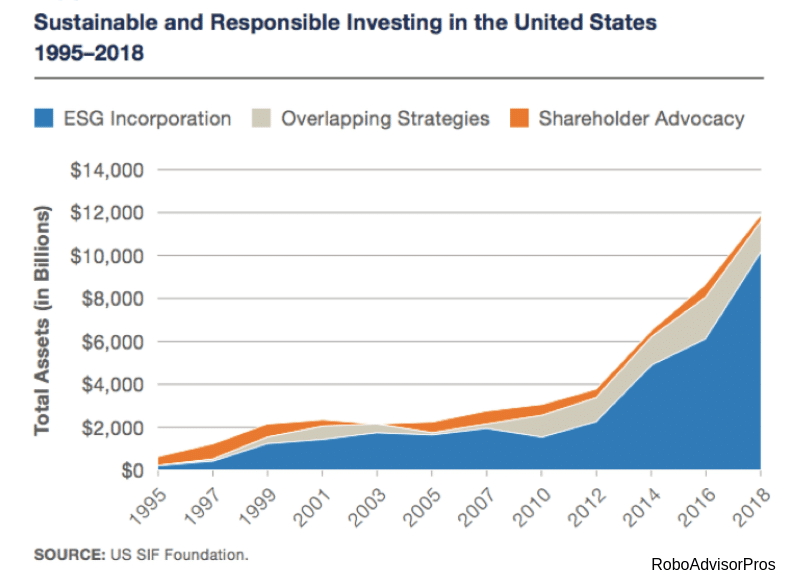 Sustainable investing has exploded, from barely a footnote in 1995 to $12,000 billion invested in socially responsible strategies. 1. Sustainable investing is a sub set of investing that focuses on investing only in companies that meet certain positive societal and environmental metrics. These might include consideration for the environment, community, positive corporate governance, fair shareholder treatment, responsible work conditions and more. There isn’t a single bar that sustainable investing companies must meet, but a basket of positive corporate practices to follow. 2. Sustainable investing has many different names: socially responsible investing (SRI), impact investing, socially conscious investing, ESG investing (environmental, social and corporate governance), ethical investing, green investing, and values-based investing. Firms that eschew sin stocks such as tobacco and gambling. Companies that serve poor and neglected communities. Companies that consider the environmental impact of their manufacturing, products and services. Companies that practice shareholder engagement and responsible business practices. Companies with responsible business practices for societal and environmental benefit. 4. Roughly one out of every four professionally managed investment dollars was invested in socially responsible strategies at the end of 2017. That amounts to $12 trillion or more, according to the US SIF Foundation’s 2018 Report on US Sustainable, Responsible and Impact Investing Trends. 5. SRI investors include the small investor, wealthy family offices, high net worth individuals, foundations, pension funds, non-profit organizations and religious institutions. In fact, there are hundreds of investment management firms that offer SRI investing funds and strategies. Sustain Invest is one investment management firm 100% devoted to SRI investing. Alternative investment funds including venture capital, private equity, REITs and hedge funds. Registered Investment companies with ESG themed ETFS and mutual funds. Community Investments like community development credit unions. 7. SRI investing goes beyond just public equity investments. Sustainable and impact investing spans the entire investment spectrum of public company stocks, fixed income, loan funds, real estate and private equity. Alternative SRI investments reached $588 billion in 2018. 8. Robo-advisors are rushing to offer SRI investments in their portfolios. The number of digital investment advisors with socially responsible options continues to grow. A few robo-advisors with socially conscious investment alternatives include Betterment, M1 Finance, Motif, E Trade and more. While Sustainfolio, is one of a handful of robo’s focused on SRI only. 9. You can get started with socially responsible investing with very little money. The iShares MSCI KLD 400 Social ETF (DSI) can be purchased on any investing platform just like buying a stock. Or you could invest in individual SRI company stocks and buy them with zero commissions through the Robinhood or the M1 Finance app. 10. An easy way to seamlessly invest with your values is to invest with a sustainably focused robo-advisor such as Sustainfolio. Investors crave investing in line with personal values and goals. Institutions are becoming more socially conscious. Clients are demanding SRI investment options. Concern for a better world is growing. Investors desire the opportunity for solid returns while investing with one’s personal values. Who Should Invest in Sustainable Portfolios? There are no rules influencing who should or shouldn’t invest in sustainable portfolios. If you are interested in global warming and climate change, then of course sustainable investing is the way to go. And, if you believe in equality and helping underdeveloped neighborhoods, then sustainable investing makes sense. As you’ll find in the next section, even if you’re seeking high returns along with societal betterment, SRI investing is a wise choice. Can I Make Money Investing Sustainably? Several studies have found that companies with socially responsible policies and sound corporate governance are also good investments. A consolidation of reputable research from Deutsche Asset and Wealth Management and Hamburg University examined over 2,000 research studies and found that most results showed a positive correlation between ESG standards and corporate performance. That means, in most cases when a company adheres to sound ESG policies their returns are also strong. 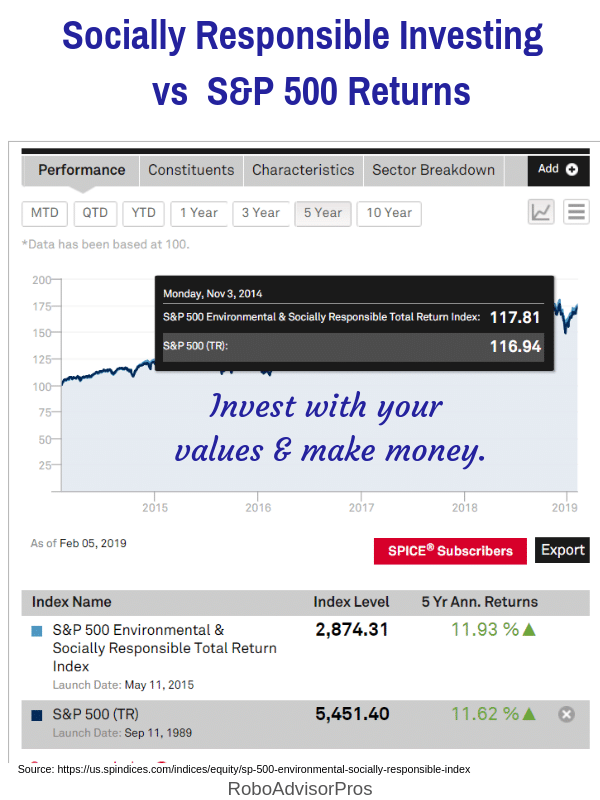 A comparison of the 5-year returns of the S&P 500 Environmental & Socially Responsible Total Return index, launched in 2015, with the S&P 500 Index shows the ESG index earned 11.93% while the S&P 500 produced 11.62% annually. Another indicator that you don’t need to sacrifice returns to invest green! Is There a Robo-Advisor Devoted to Sustainable Investing? Sustainfolio is the only robo-advisor completely devoted to sustainable investing. This socially responsible robo-advisor is a division of Sustaininvest Asset Management, founded in 2013, and is an independent investment firm 100% focused on sustainable investing. Dale Wannen, founded the Sustainfolio Robo-Advisor to further the mission of sustainable investing. He’s the real deal with 18 years in wealth management and financial services. Wannen aligns his dollars with his passion and donates 1% of the company’s annual sales to environmentally focused non-profit organizations. In his spare time, Wannen engages in sustainable investing advocacy! If you prefer a socially conscious investing robo advisor, instead of the DIY investment approach, learn more about Sustainfolio. Overview Robo-advisor with socially responsible investments only. Top Features Fully curated portfolio of stock and bond ETFs committed to investing in SRI firms. Both stock and bond funds are SRI screened. Annual portfolio checkup for all investors. Free Services Free blog with sustainable investing resource articles. Investment Funds Diversified, low-fee stock & bond ETFs from various providers including iShares, Nuveen and Schwab. The funds have been hand-picked and screened according to their ESG characteristics. Promotions Not available at this time. What Differentiates Sustainfolio from its Competitors? Sustainfolio only invests in funds that own shares in companies that have passed socially responsible investment criteria. The company hand-picks the investment funds based upon their adherence to SRI criteria as well as a low fund management fee structure. Other robo-advisors that offer sustainable investing, such as Wealthsimple and Betterment offer the SRI option as an a la` carte item, not their sole focus. Sustainfolio is the only complete robo-advisor 100% committed to socially responsible investing. 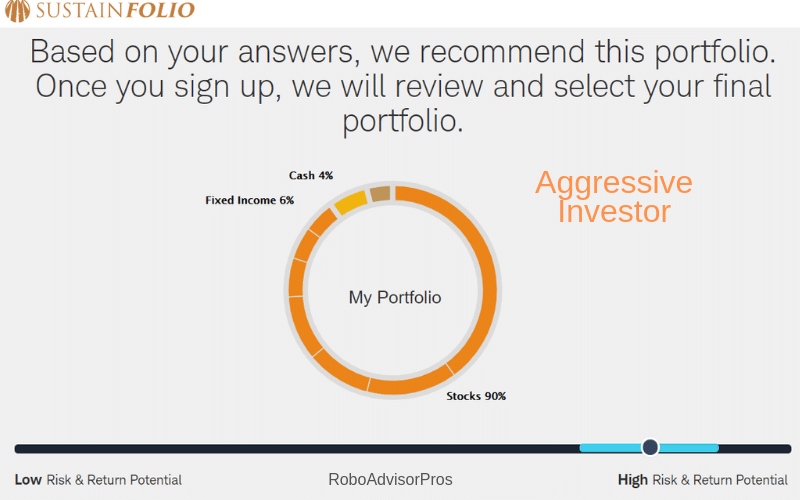 Charles Schwab is the custodian for the Sustainfolio robo-advisor. The account is protected by SchwabSafe, a collection of security tools that keep your personal and financial information safe. Who Benefits from Investing with Sustainfolio? Anyone who wants to invest in line with their personal values is a good candidate for Sustainfolio. Younger investors who want to support clean air, clean water and low carbon emissions. Experienced investors who prefer not to DIY their sustainable, socially-conscious investing. How Does the Sustainfolio Platform Work? When you’re ready, click on the “Institutional Intelligent Portfolios” and you’ll be taken to the robo-advisor platform on the Schwab website. Input the access code and you’re on your way. Even if you’re not ready to commit, you can take the initial questionnaire and find out what your portfolio would look like. Initial questionnaire – answer a few questions related to the goal of the account, risk level, time horizon, and account type. Based on your responses to the questionnaire, you’ll be provided with an asset allocation, showing the percentages invested in various asset classes. Next screen is sign up and onboarding. If you have an existing Schwab account, you can login with your id and password. The asset allocation of a Sustainfolio investment portfolio is like any diversified investment portfolio. The difference lies not in the asset classes, but in the investment funds. Every fund is comprised of socially responsible companies. What Investments Does Sustainfolio Offer? 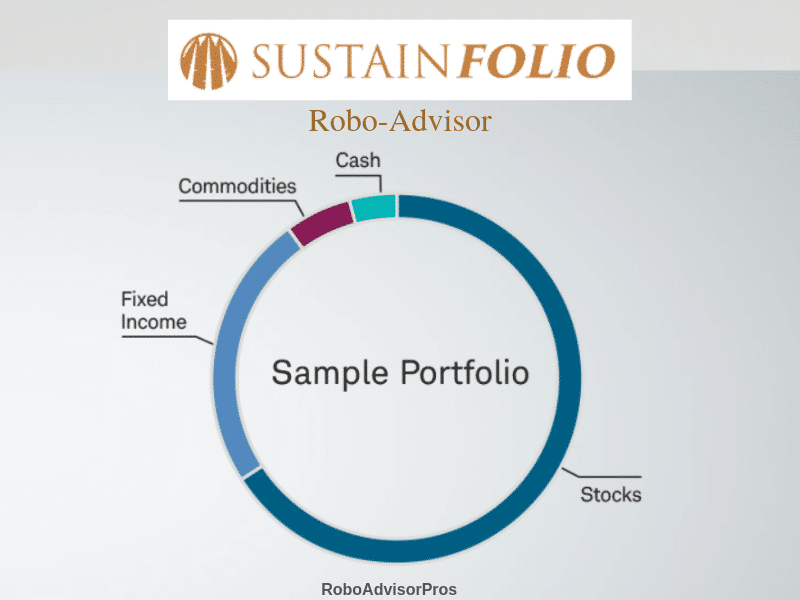 Sustainfolio Robo-Advisor offers hand screened, diversified, low-fee exchange traded funds (ETFs) selected due to their ESG characteristics. Fund providers include Schwab, iShares, and Nuveen. By investing in these ETFs, you’ll get diversification, and you won’t need to evaluate a company’s ESG records on your own. Sustainfolio offers 12 portfolios ranging from very conservative to aggressive. As would be expected, more conservative investors will own greater percentages of fixed/bond income and cash with a lower allocation to stock funds. While aggressive investors will own more stock ETFS and a smaller percentage of fixed income funds. Each investment portfolio owns approximately 10 funds. Here’s a sample Sustainfolio portfolio for an investor saving for retirement many decades into the future. This portfolio is suitable for an aggressive investor who’s comfortable with risk. You’ll notice a 90% stock allocation. This is suitable for a younger investor or one who strives for the highest returns and tolerates investment volatility. The Sustainfolio portfolio is diversified and spans a wide range of important asset classes. This is helpful when one asset class underperforms, there will be others that will offset losses with gains. And, each investment is pre-screened for environmental, social, and governance (ESG) criteria, even the bond funds. If your circumstances change and you want to switch your asset allocation, it’s easy. Just retake the initial questionnaire to update your asset allocation percentages. For example, let’s say you get a promotion with a big salary increase and you want to invest more aggressively. Retake the questionnaire and if your profile changes, so will your investment allocation. What Types of Accounts are Available at Sustainfolio? What Services does Sustainfolio Provide? Schwab Performance Technologies automatically trades and rebalances your Sustainfolio investments when they drift from your preferred asset percentages. The Sustainfolio robo-advisor also offers tax-loss harvesting for taxable accounts. This strategy sells funds with losses to offset capital gains, thereby reducing your taxable income. The robo-advisors also offers an annual “checkup” with a financial advisor, for clients seeking a conversation about current market conditions, their personal allocations and their risk profile. For investors seeking a full service ESG financial advisor to work on more tactical investing, the Sustaininvest Asset Management firm is available. What are Sustainfolio’s Investment Minimums and Fees? Sustainfolio requires a minimum $5,000 investment amount. Smaller investors seeking socially conscious investing might check out the Swell Investing App. The annual management fee is .50% of assets under management. So, if you have $5,000 invested, then your annual fund management fee would be $25.00 or a bit more than $2.00 per month. Additionally, like all robo-advisors the individual ETFS charge small management expense fees that go directly to the fund company. Sustainfolio is ideal for the socially conscious investor seeking a robo-advisor with lower fees than most human financial advisors. You can be assured that your investing is in line with your personal values. Sustainfolio’s relationship with Schwab ensures that the portfolio, platform, and security are handled by one of the top financial custodians in the business. The opportunity for an annual “financial checkup” is a great add on to make sure that your investments are in the proper allocation for your current needs. If you’re seeking rock bottom fees, there are other robo-advisors that charge lower management fees. The $5,000 management fee might be steep for the beginning investors. There are other robo-advisors with low minimum investment requirements. More and more investors are living in line with their values and principals. From eating organic food, driving an electric car or working for a company that cares about its employees, socially conscious living is growing. Many robo-advisors and investment companies are adding socially-conscious or sustainable investment options. Fortunately for investors there are hundreds of funds that screen firms ESG practices. Finally, Sustainfolio is currently the only full-service robo-advisor devoted to sustainable investing. The fact that Sustaininvest donates a portion of its profits to related causes and the company owner, Dale Wannen is an advocate ensures that you will be investing with a true sustainable investing practitioner. With Schwab running the back-end, you can invest with confidence in the Sustainfolio platform. Go directly to the Sustainfolio website. This article was sponsored by Sustainfolio, although all opinions expressed are my own. The post A Complete Guide to Sustainable Investing for Robo-Advisor Investors – Everything You Need to Know to Become a Sustainable Investor appeared first on Robo-Advisor Pros.